What’s the right kind of mulch? How much do I put down? When’s the best time to mulch? How often do I need to amend the mulch? Is mulch the best weed barrier? Great questions about a basic garden element. Fall is the best time to give your trees a good layer of mulch. Mulch is an important facet of your garden, and too often, its use and application are ill-informed or misconstrued; the most prevailing idea is that mulch is a definitive weed barrier. I hate to be the bearer of sad news, but the answer to that one is, well…have you noticed that weeds will grow quite well from the seams in the sidewalk? Or from the smallest cracks in the driveway? Or apparently straight out of bare concrete along the expressway? So, seeing that weeds will grow in the most adverse circumstances, you can safely assume that an organic medium such as mulch will inevitably play host to weeds as well and just live with it. (Besides, they pull out easily). When we consider that many shrubs and trees are planted either singly or in groupings throughout turf areas, we need to imagine what’s going on underground, where the roots grow. One common plant myth that was taught to me thousands of years ago in the fifth grade was that the taproots of all trees go down as deep into the earth as the tree is tall. The fact is, most mature trees don’t have taproots; instead, they have large, lateral, anchoring roots that tend to dominate the side of the tree that faces into the prevailing winds. As these major root structures fan out into the surrounding soil to gain a firm hold, their secondary roots likewise fan out laterally; branching out into progressively smaller and finer filaments that probe the soil for water, oxygen, and nutrients. Research has found that the smallest of these roots can be the diameter of a human hair and extend hundreds of yards away from the tree! And their depth in the soil can be from 8 inches to 2 feet down, depending upon the soil composition. They grow best where the oxygen level remains above 18 percent. Clay soil, consisting of densely compacted soil particles, will cause roots to grow higher in the soil than a sandier, looser soil, and 75 percent of the tree’s root mass can be found within its drip line. Trees spread their roots! 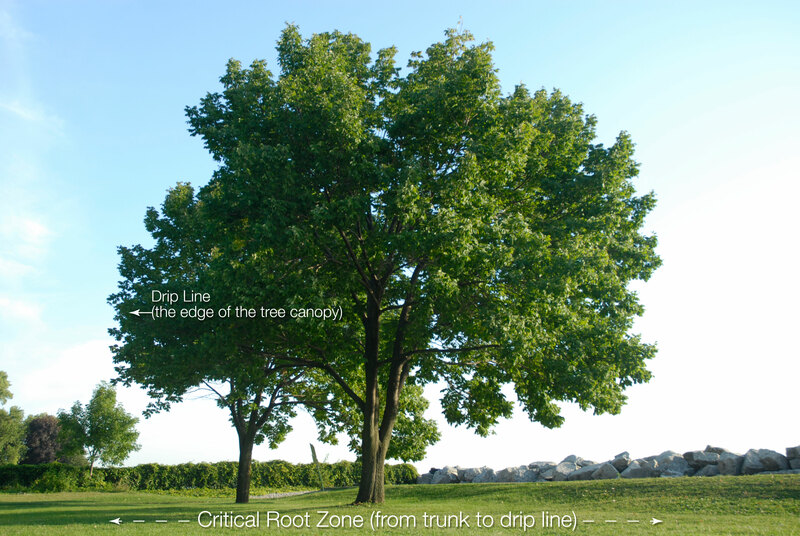 The full root zone of a tree extends two to three times beyond the critical root zone. What’s a drip line? Imagine the tree’s canopy of leaves to be the protective canopy of an umbrella, and the handle is its trunk. The point on the ground directly below the canopy edge where the rain drips off of the umbrella is its drip-line. 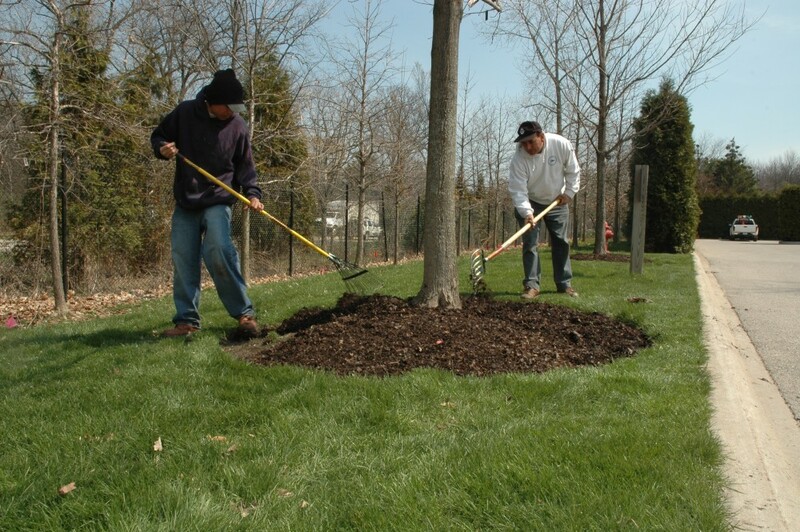 The circle on the ground which this area describes encompasses the tree’s primary root zone, and this is the area from which the tree derives its greatest benefit from proper mulching. Typically, this ground area consists of turf. How many grass roots do you imagine this to contain? For smaller trees, this would number in the hundreds of thousands; larger trees would count in the millions. Like the tree’s roots, each of these grass roots is also searching for water, air, and nutrients; and, since they’re closest to the surface, guess which roots are going to capture the most of these essentials? Correct: turf will hog it all first. Therefore, to better serve the deeper needs of the more significant plants—trees and shrubs—it’s best to eliminate the competition. And let’s face it, the garden has its hierarchy of plants, and it’s best to sacrifice the smaller for the sake of the grand. Once removed, the former turf area now can receive a 2 to 4-inch (thumb-deep; no more!) 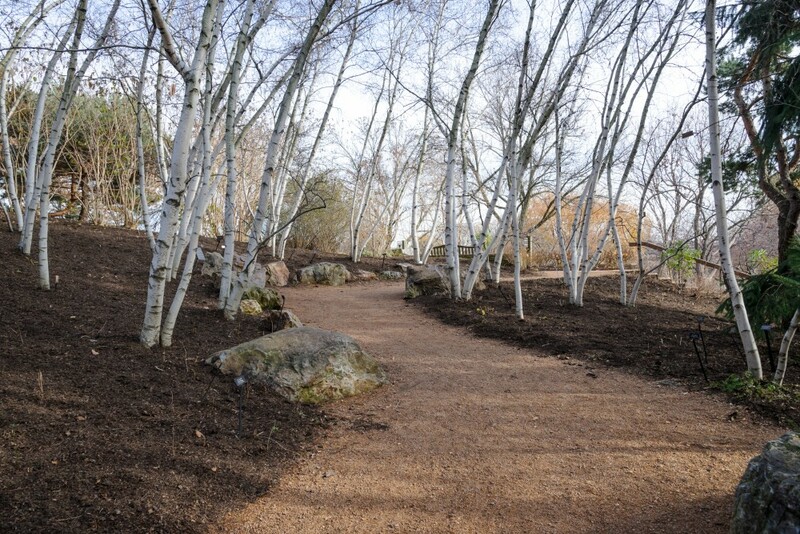 layer of organic mulch to stabilize the soil and allow for the unrestricted passage of air, water, and nutrients through the soil and into the tree’s root zone. With the root zone de-turfed, the repetitive visits of mowers and accompanying foot traffic reduces soil compaction in this area, which is significant, because the air spaces between the soil particles are very important for the health of the roots, as they serve as a conduit for the movement of air and water through the soil. Additionally, with mowers and weed whips relegated to the drip line, there are far fewer opportunities for damaging contact with the bark, which, if injured, can threaten the health and longevity of the tree, depending upon the extent of the damage. Nothing lasts forever, and good organic mulch continues to compost down to nothing. Well, nothing that you can see, but something that amends the soil over time, and improves the overall friability—the “crumbliness” and breakdown of the adhesion of clay. It’s a continuing investment; not a waste of money. With the proper addition of organic mulch over time, you don’t even need to consider the addition of chemical nutrients. Yes, shredded rubber mulch will last until the end of time, but trust me, your plants won’t like it. An annual good feeding of organic mulch will prove to become a pillar of your overall garden quality and success. 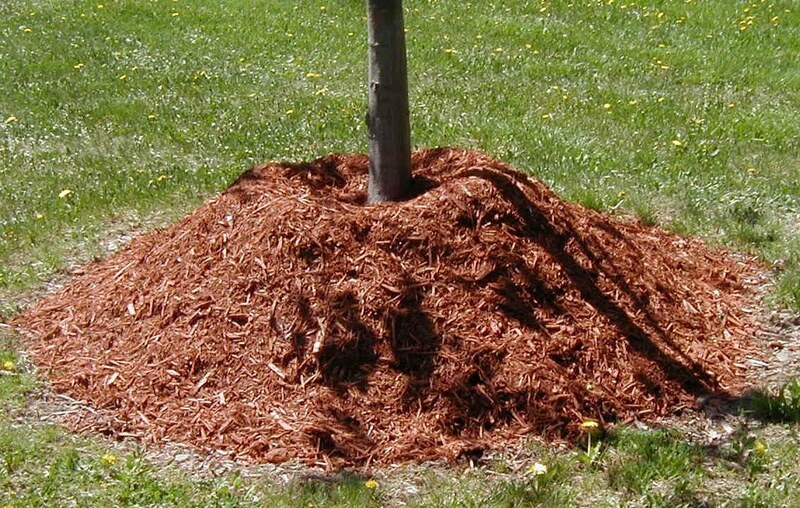 Another way tree bark can be damaged is—believe it or not—mulch itself! You’ve likely seen it widely practiced by landscapers and homeowners alike: the piling up of mulch around the base of the tree into a conical mound that sometimes reaches depths of a foot or more: the dreaded “mulch volcano.” Considering that there are none to very few “working roots” located this close to the base of a mature tree, this pile of mulch serves no horticultural benefit to the tree (and likewise with shrubs). For a young, newly-planted sapling, this pile can easily cover the total root mass, and the mulch volcano can actually shed water away from the roots! The detriments are many, as this mulch pile will retain whatever moisture content exists in the mulch against the bark, which, over an extended period of time, can soften and begin to rot because of this continuous moisture. In this compromised state, molds, blights, bacteria, bugs, vermin, and more can gain entry otherwise prevented by dry, healthy bark; it’s an even more egregious intrusion with thin-barked trees and shrubs. This is an easily avoidable mistake. Gardeners, remember that mulch should NEVER touch the bark! Think of mulch as being the same as soil: you would never plant a tree or a shrub too deep; placing the bark under the soil, would you? After all, that’s the roots’ job, right? Despite occasional rain or snow, the bark remains dry in the open air while the roots do their job under the soil. When these factors get reversed, the plant loses. Emulate what happens in nature: use leaf mulch from the trees that are in the area to keep your soil’s pH constant. Stick with the basics and emulate what happens in nature: trees in the woods drop their leaves to the ground below, where they remain relatively close to their parent plant, compost naturally, and provide the optimum benefits of mulch. This has worked well without human assistance for eons. Why mess with success? Save the shredded tire mulch for the playground. And save the free wood chips municipalities provide for things that begin with the letter “P,” such as pathways (they make a great barrier against mud! ), playgrounds, picnic grounds, and parking areas. Wood chips are not composted, easily wash away with a hard rain, and frankly, look out of scale with smaller trees, shrubs, and perennials. Remember, those wood chips are free because it’s cheaper to give them away than to haul them away and pay for disposal. So do your trees a favor, and treat them the way that nature does—they’ll be the better for it!